The latest list of the 50 fastest-growing companies in Virginia shows some contrasting trends. The company with the highest revenue growth in the 2014 Fantastic 50, Arlington-based Millennium Corp., had a four-year growth rate of 2,723 percent. That figure represents an increase of 558 percentage points from the 2,165 percent four-year revenue growth recorded by last year’s leader, McLean-based Integrity Management Consulting. That increasing growth rate, however, did not carry over to the list as a whole. The median revenue growth of the 50 companies on the list was 168 percent for the four-year period tracked by the program (2009 through 2012). By contrast, companies on the 2013 list had a median growth rate of 243 percent last year, 75 points higher than the previous year. In fact, this year’s median growth is less than half the 354 percent growth rate seen in 2011, the year of highest growth in the past five years. The 2014 list also is distinguished by the return of manufacturing companies. There are three manufacturing companies on the list this year after having none last year and only one in 2012. The Fantastic 50 has been dominated for many years by service and technology companies, many of which are government contractors. Program sponsors honored all of the companies on the list at a banquet scheduled for May 1 at the Westfields Washington Dulles Marriott hotel in Chantilly. In addition to the company with the highest revenue growth, Vanguard awards are given to the leading companies in four other industry categories. Manufacturing: First Line Technology in Chantilly. Retail/Wholesale: Morooka USA in Ashland. Technology: TTC Inc. in Arlington. A breakdown of companies on the list this year shows 24 are technology companies, while 20 are service companies. Like manufacturing, the retail/wholesale category had three companies on the list. Thirty-four of the companies are based in Northern Virginia, while seven are in Hampton Roads. The other nine are in Fredericksburg, the Richmond area, the Lynchburg area and the Shenandoah Valley. 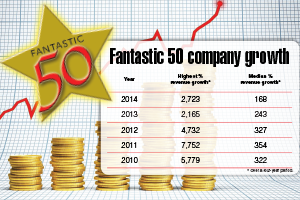 To be eligible for the Fantastic 50 this year, a company must have had revenue of at least $200,000 in 2009. It also must have made a profit in 2012 and have revenue of less than $100 million in its most recent fiscal year.